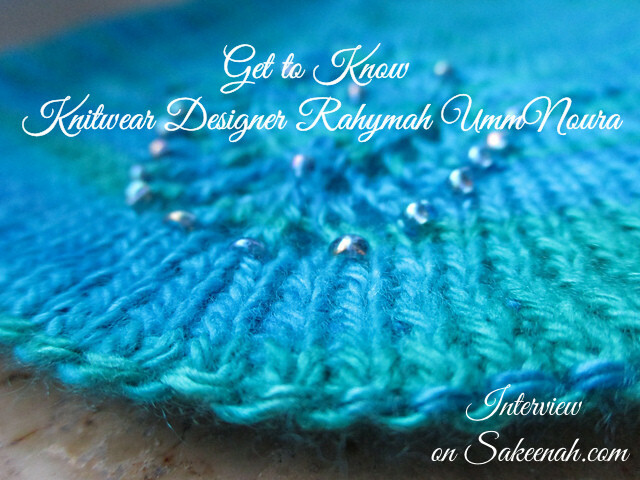 It’s a pleasure to present an interview with knitwear designer Rahymah UmmNoura of Rahymah Handworks. Rahymah’s designs are stunning and I really admire them, mashaallah. Rahymah’s most recent design, La Pasionaria, is an elegant beaded cardigan that is a beauty to behold. I’ll let the picture speak for itself. Grab a cup of tea and let’s get to know Rahymah. When I was a small child, my grandmother taught me the basics (after I got on her nerves begging her to do so). I felt like I was struggling a lot with the tension and mesh structure, so I gave up. Later when I was grown and picked up the needles again, I discovered that she wrapped the yarn in the wrong direction, and this explained some of my difficulties. Then I have taught myself with books, videos and a lot of practice, trying, failing and trying again. I love to work with new techniques and challenge myself to improve my skills. Do you know any other crafts or have other hobbies? When you improve your skills, it becomes more and more difficult to find patterns that are exciting and challenging. So I started to look deeper into garment and lace construction and tried to create something by myself. Everything that moves me emotionally is an inspiration. That may be a walk outside, flowers, falling leaves, scents, yarns, colors, light … everything that catches my attention and touches me emotionally. What advice would you give to aspiring fiber artists? Once you improve, work with high quality fibers. Don’t be afraid to make mistakes. Mistakes and failure are part of the progress and they are good teachers. If you decide to teach one day, it is very helpful to understand your students if you have made similar mistakes on your way to where you are now. What are you most proud of about your piece? Actually I’m not proud. I’m very self-critical and rather surprised by the positive response it gets. When I look at my designs, I always see something that I could have done better. Being praised this much just makes me humble because I don’t see myself like that. I love Rahymah’s designs so much. They are all swoon worthy. It’s really hard to pick out a favorite, but one that is telling me to hurry up and learn to knit is Cherry Blossoms. 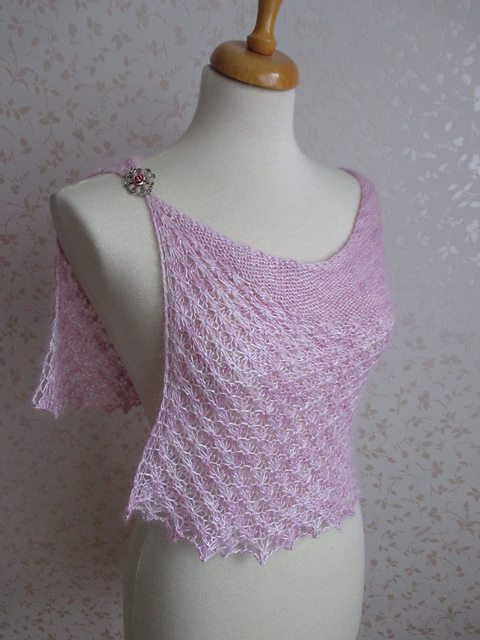 I just love the versatility of this knitting pattern! 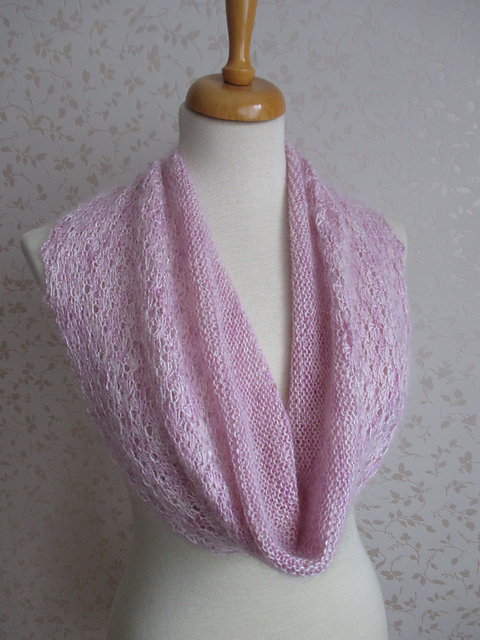 Cherry Blossoms is a cute, reversible, convertible and playful little wrap/cowl/shawl that can be worn in different ways with or without negative ease. One side shows smaller, framed blossoms, the other side bigger blossoms without frame. The texture of the stitch pattern creates a soft and cozy feeling around the shoulders, warming you in a chilly breeze. The semi-solid, hand-dyed silk mohair fiber is just perfect for this pattern, putting the blossoms in motion and creates a beautiful drape. The Cherry Blossom Pattern comes with written instructions and a chart for the blossom stitch pattern. I hope you enjoyed getting to know Rahymah a little more. 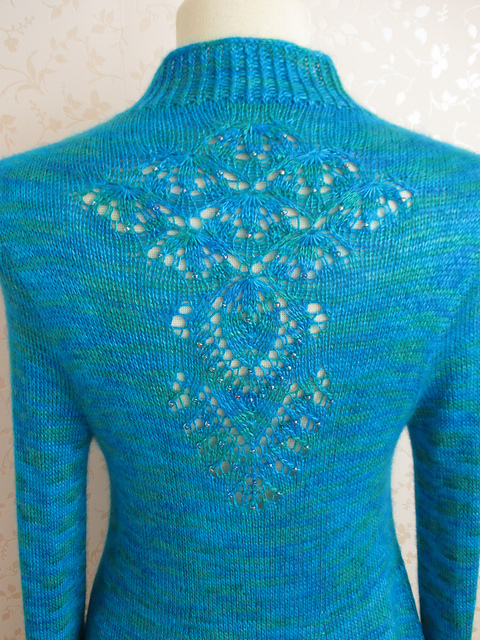 You can see all of Rahymah’s designs on Ravelry. Rahymah Handworks is also offering a great giveaway, winner to be announced 10/27, to celebrate 500 likes on her Facebook page, check it out! MashaAllah, I love her designs!!! Thanks for featuring her so we can get to know her better. Thanks, Nancy! I’m so happy you enjoyed learning about Rahymah! This was great. I really love Rahymah’s knitwear designs. I’d love to improve my knitting skills enough to whip up a few of her patterns.